The Educational Institute of Scotland has called for a 10% rise following public sector pay caps. Protest: Teachers marched on Saturday. Scotland's largest teaching union is calling on members to reject what it describes as a "divisive" pay offer as a ballot gets under way. The Educational Institute of Scotland (EIS) has been calling for a 10% rise to restore the value of salaries following public sector pay caps. It says a Scottish Government offer which would see all teachers get an increase of 3% is not good enough. 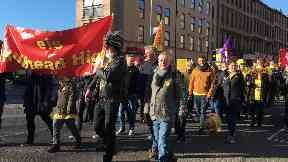 Thousands marched in Glasgow on Saturday in support of teachers campaigning for a 10% rise. EIS general secretary Larry Flanagan said: "The EIS is clear that the current offer from the Scottish Government and Cosla is not good enough, as it fails to address adequately the 24% real terms cut of the past decade, is divisive in nature, and will do little to attract the new teachers that Scotland desperately needs, or to retain the experienced teachers who offer so much to Scottish education. "Our members turned out in record numbers on Saturday, and we are confident that they will also turn out in huge numbers in this ballot. "An overwhelming vote to reject the current divisive offer should bring the Scottish Government and Cosla back to the negotiating table - or else they risk forcing Scotland's teachers into a campaign of industrial action." Education secretary John Swinney said he "hugely valued" the work teachers do. He said: "Through a combination of a 3% increase for all staff earning up to £80,000, restructuring the main grade scale and annual progression, the majority of teachers receive a rise between 5% and 11%. There would be a flat rate increase of £1,600 for those earning more than £80,000 from 1 April 2018. "I firmly believe this is a generous and fair offer which demonstrates the value both the Scottish Government and local government place on the teaching profession. "We remain committed to continuing discussions with teaching unions in good faith." The ballot will run for three weeks, until Tuesday November 20.